This is the conn, the periscope stand, the watchstation of the officer of the deck. Sonar repeater consoles, the sonar computer, fathometer readouts, the underwater telephone (sonar transmitter for use in post shipyard trials and exercises) and communication circuits are included in the console. 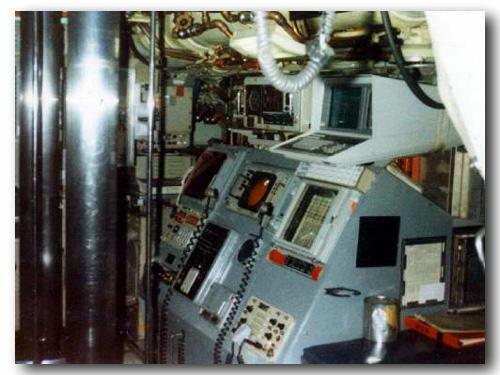 To the left of the sonar computer is the WLR-9 readout, a sonar set that acts like a "radar detector" for the sub. If it hears a Russian Blocks-of-Wood sonar (which sounds like two wood blocks clicking together) it alarms. Appropriate, because the Russians confirm their solution range just before shooting a torpedo using Blocks of Wood sonar. WLR-9 also alarms on other detected sonars, but like the car's radar detector, it is prone to false alarms. To the left are the periscopes. The forward unit, the number one, is a World War II vintage set. The aft is the one we used, the number two or Type 18, with all the goodies. Magnification, video piped into the room to a monitor above the ship control panel, night light enhancement, infrared, still photo, with ESM radar detecting antennae and radio receive-only antennae in the body of the radar-absorptive-material shroud. Any radar signals that hit the periscope made a speaker behind the scope go "bloop" or "bleep." Beautiful unit, but its 24" diameter optics and electronics module went from your chin to your toes, and when standing periscope watch for hours you'd soak the front of your shirt and pants with sweat from the heat of the optics module. That's why we called periscope watch "dancing with the fat lady."